29 Feb 2016 – Towards the end of last year, we visited the back yard of Angelo who is a presenter, trainer, and writer in the areas of sustainable gardening and Permaculture. In a word, his backyard was Amazing. The productivity of his garden per square foot far exceeds many commercial farming operations and a major component of his system is that it is a No Dig Garden. Part of the intent of this blog is to challenge some of the assumptions we hold as truth. One such assumption is that gardening involves digging. I had a eureka moment when visiting Angelo’s backyard oasis: in nature you don’t see anybody digging. Why then, do we do it? What is its benefit? Is there a better way to manage the Earth? To challenge this assumption of needing to dig, I am including below an article from Angelo’s world-renowned blog Deep Green Permaculture. To view the original article, click here. Since reading it, we have since created our own experimental no dig garden at home. I’m sure we’ll be blogging about how it works out as soon as we know the results! Thank you Angelo for causing me to question this assumption and to get me thinking about this critical component of gardening. Everyone agrees that gardening would be way more fun, and many people would be more inclined to take up gardening if there wasn’t the need for all that back-breaking hard work such as digging… It may be a surprise to many people, but digging IS NOT a necessary part of gardening at all! So how did we get into the habit of digging up our gardens in the first place? Basically it’s just old tradition. Historically people have treated their gardens like miniature farms, people looked at how huge areas of land were farmed, and then did the same on a smaller scale, because that’s what they knew how to do. You may be asking “Why do farms till the soil anyway?” The answer is because tillage (i.e. ploughing) helps loosen compacted soil which makes it easier to plant into, rips up weeds, and buries the scraps left over from harvesting. This then raises the logical question, why is the soil compacted in the first place if it’s constantly tilled? There are several causes re-compaction of tilled soil, namely animal-powered and mechanised farm equipment, such as tractors and oxen, people walking on the soil and rain impacting on bare soil! Before we can understand the reasons for not digging soil, it’s important to understand what soil is, otherwise it’s not clear what we’re dealing with. The soil is not just ‘dirt’ to anchor plant and tree roots, though that’s how many people treat it! The soil is a very complex ecosystem, teeming with very diverse life. In fact, the soil is more abundant with life and more complex than any other ecosystem above the ground. There are about 50 billion microbes in 1 tablespoon of soil. By comparison, the human population numbers just over 7 billion currently. These organisms include Bacteria, Actinomycetes, Fungi, Yeast, Protozoa, Algae and Nematodes. Furthermore there are arthropods and insects in there as well, including earthworms. That’s a lot of life in the soil! So what are all these critters doing in the soil? The soil bacteria form a beneficial relationship with plant roots, and soil fungi form a beneficial relationship with tree roots, helping them access nutrients. The soil organisms carry out the important functions of nutrient cycling, improvement of soil structure to aid water and air movement through the soil and also the control of diseases and enhancement of plant growth. Most of the soil fungi occupy the top 15cm (6”) of the soil, while the rest of the organisms live at all different levels. Digging and turning over the soil exposes a very delicate ecosystem to the air which dries it out, and to the ultraviolet rays of the sun, which sterilize the soil – killing the soil organisms. The soil loses a lot of its nutrients, such as carbon and nitrogen. It also loses a lot of its organic matter, and as a consequence, does not retain water as well. The delicate soil structure is destroyed, compaction of soil occurs, leading to hardpan formation, and reduced water infiltration in the soil, and more surface runoff, which increases soil erosion. Tillage is the term used to describe the agricultural preparation of the soil by digging it and turning it over. So why are the farmers so fond of this destructive practice? Well, they found that when you first dig up the soil, fertility goes up, and plants grow better. The reason is that the tiny little bodies of all the soil organisms that have just been killed by digging break down, releasing their nutrients to the soil. The catch is, it only works once, and then your soil is sterile and the plants are worse off, and they become more prone to diseases, and require even more fertilizer than they normally would. To further compound the problem, chemical fertilizers are pumped into the dying soil, which effectively kill off what soil life is left. Yes, chemical fertilizers kill soil life! It’s really a fool’s game to destroy the soil life for a short-lived, once off nutrient boost, which really shows gross ignorance and a complete lack of understanding of soil ecology and what makes plants grow! That, in a nutshell, is why we don’t dig the soil! In Nature, soil does not need to be manually cultivated for spectacular forests to grow. What holds true in Nature also holds true in the garden. In a forest, organic matter in the form of fallen leaves, twigs and branches, annual plants at the end of their yearly cycle and other plants at the end of their lives, are all deposited on the forest floor when they decompose into rich humus. 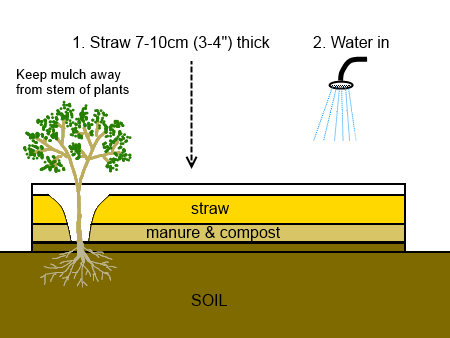 We can add organic matter directly to the soil surface, such as manure, compost, straw, leaves etc. Garden waste such as prunings from trees and shrubs can be fed into a mulcher to break them down into smaller pieces, and then spread over the soil as a mulch. 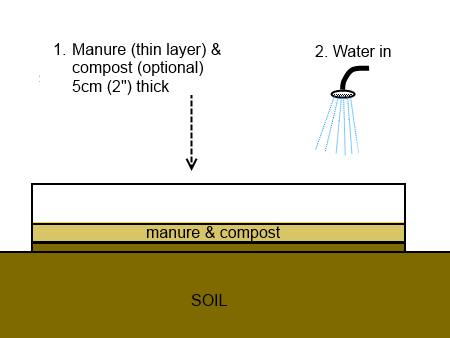 Adding a layer of organic matter over the soil, in a layer approximately 5cm-15cm (2”-6”) thick is in effect ‘sheet composting’, where the garden beds become large composting areas. By the action of earthworms, bacteria, fungi and insects, the organic matter is slowly broken down and released into the soil, providing nutrients to the garden. Because the soil is not disturbed, a stable soil ecosystem is created, and plant health is improved. Moisture is also better retained due to the mulching, and the organic matter in the soil works like a sponge to better retain the moisture in the soil. The mulching also prevents soil erosion, stops runoff of rainwater across the surface, and assists the rainwater to percolate into the soil. The earthworms will create channels in the soil, which will help both water and air to penetrate into the soil. With no-dig gardens, the soil is not compacted because it is not walked upon! Stepping on the soil destroys the soils structure by compacting it, preventing air and water penetration to the plants roots, which affects plant health, restricts plant growth and reduces productivity. Paths are constructed for people to walk on, the garden beds are for plants ONLY!!! One thing I haven’t mention so far is that Nature does dig, but not in the way we humans do, but far more efficiently – with earthworms! When there’s digging to be done, let the experts do the work! One hectare of land can support up to 7 million worms, which all collectively weigh 2.4 tonnes, and in favourable conditions they can turn over around 50 tonnes of soil per hectare each year, enough to form a new layer of topsoil 5 mm deep. It has been reported that in one trial worms had built an 18-cm thick topsoil in 30 years. Earthworm burrows aerate the soil and allow the the drainage of water up to 10 times faster than soils without earthworms. Uncultivated soils with high populations of earthworms have up to 6 times greater water infiltration than cultivated soils, which reduce earthworm populations. 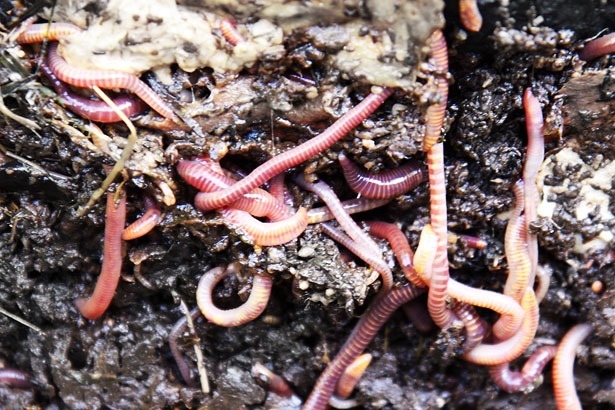 Worms help plants grow better – worm castings are richer in nutrients than the surrounding soil with phosphorus levels four times higher than the soil and nitrogen that is readily available to plants. Their burrows allow plant roots to reach deeper into the soil to access more water and nutrients. In addition, the burrows also contain nutrient rich worm castings. This clearly shows us that earthworms can dig a lot more soil than we can in a much more efficient manner, but even more so, they can dig soil in a way that produces many additional benefits. When we dig the soil, we damage it! That should be enough convincing that it’s best to let the worms do their job, and that its in our benefit to build no-dig gardens. So without any further ado, let’s look at what no-dig gardening is all about. In 1977, Esther Dean, an Australian gardener and author, pioneered the technique commonly referred to as “no dig gardening” with the publishing of her book “No-Dig Gardening and Leaves of Life”. Since that time, countless no-dig gardens have been built worldwide and the technique is thoroughly time-proven and tested. It has proven to be an immensely productive way to grow all manner of trees and plants. There are many variations of how we can build a “no dig gardening”, but they all use the same underlying principle, which is soil building. No-dig gardens can be constructed anywhere because this technique creates soil – a rich, dark, healthy, nutrient-filled humus which plants love. They can be constructed over soil, existing lawn or concrete. 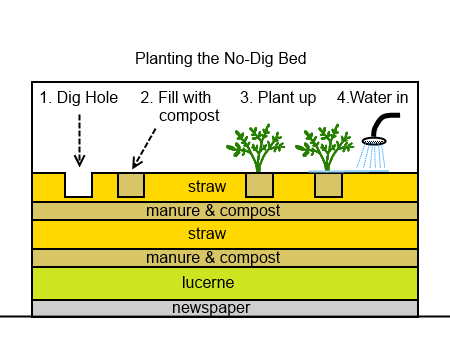 As a brief description, the way the technique of no-dig gardening works is that of different organic materials such as pea straw, lucerne, animal manure, finely-chopped prunings, kitchen scraps, compost and laid down in layers over each other to create what is essentially a thick, flat composting system that fills a garden bed. To plant seedlings or plants into such a garden bed, small ‘pockets’ or holes are made that hold as much compost as a small pot that you could grow the plant in, they are then filled with compost, and the plants planted into them. It’s really simple, and the results are incredible. Essentially the no-dig garden is constructed of alternating layers of carbon-rich and nitrogen-rich materials, just like a properly made compost heap. Building a no-dig garden is a very simple technique that doesn’t take very long. I teach no-dig gardening classes where students get to build a no-dig garden for the first time ever, and a small group can easily construct and fully plant up a 1m x 4m (3’ x 12’) no-dig garden in around 30 minutes. 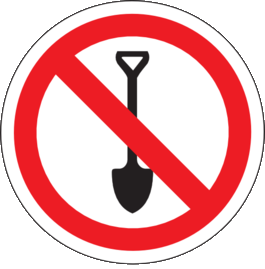 No dig gardens built on concrete, paved areas or rocky ground. No dig gardens built on existing garden beds or lawns. The only difference is that you need to add an extra layer first when building on hard or rocky surfaces. 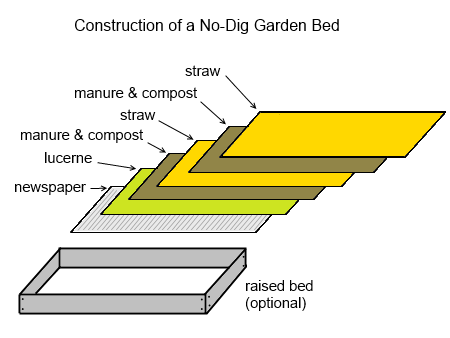 Select a suitable location to construct a no-dig garden bed. Ideally it should be on a fairly level surface, and it should receive 5 hours or more of sunlight each day.You can build the no-dig garden over any surface, over existing soil, lawn, concrete or paved surfaces – the first step of the construction will vary depending on the surface. 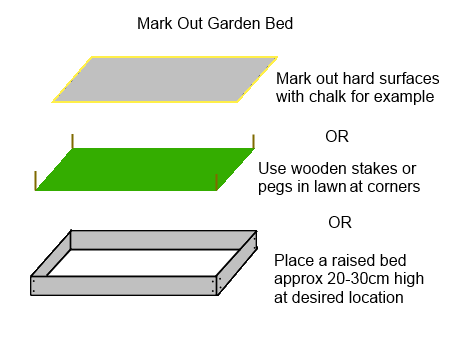 Either mark out where the no-dig garden bed will be, and build it without ‘sides ‘ or edging, or construct a raised bed (see article here). If building over concrete, paving, rocky ground or other hard surfaces, first lay down a layer of small sticks and branches, twigs and old dry leaves 7-10cm (3”-4”) thick. This layer helps with drainage so water doesn’t pool on the hard surface and create a waterlogged soil.You can also add dried seaweed (if you can get it) to this layer. If building over lawn or grass, you can mow the grass very low first, or just leave it. Next, fertilise it with plenty of blood and bone and lime, and then water it in. The fertiliser will help the grass rot down once it is covered up and buried under all the layers that will go on top of it. 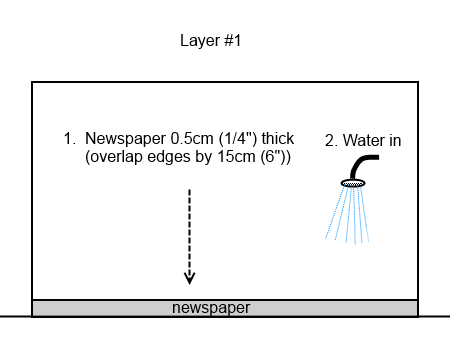 Lay down sheets of newspaper in layers approximately 0.5cm thick (approx. 1/4” thick), and overlap the edges by 10-15cm to prevent grass or weeds growing through. Using a watering can or hose, water the newspaper well. This newspaper layer will hold moisture and act as a weed barrier. It will gradually break down over time. If using cardboard, you will need to pre-soak it in a bucket of water first, which is not as easy. The other issue with cardboard is that it contains glue made of borax, so it’s really a second choice. Use newspapers if they are available, and more importantly, do not use glossy printed paper or office paper, they contain toxic inks and bleaches, something you don’t want going into your food! 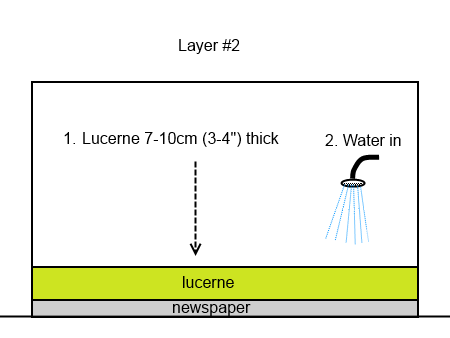 Lay down a layer of lucerne approximately 10cm (4”) thick over the newspaper. Using a watering can or hose, water in well. You can use any other carbon containing material such as peas straw, hay, sugar cane mulch, etc, but lucerne is preferable because it has a higher nitrogen content than the other straw materials, and breaks down more easily. The carbon to nitrogen ration (C:N) for lucerne (alfalfa hay) is 18:1, while the straw is 80:1. Sprinkle a thin layer of manure. 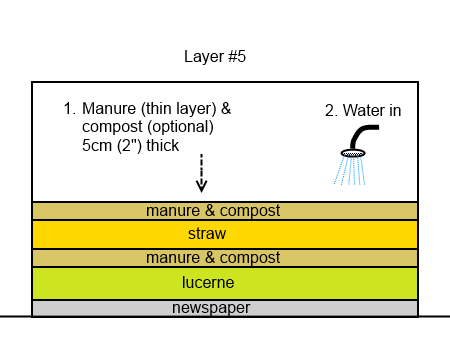 You can also add compost to create a layer 5cm (2”) thick. *** NOTE: If you want to add other ingredients such as kitchen scraps, worm castings, or rock dust into your no dig garden, this is the layer you add them to. Just use a thin layer, don’t overdo it! The worm castings and rock dust can also be used in the upcoming higher layers, but kitchen scraps need to be placed in this lower layer only to keep it well buried, this prevents vermin such as rats and mice digging it up to get to it. 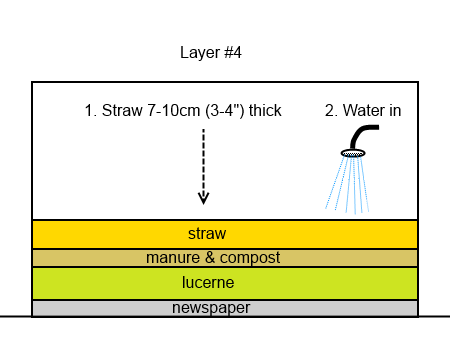 Lay down a layer of straw approximately 10cm (4”) thick over the layer of manure or manure/compost. You can use any carbon containing material here such as peas straw, hay, sugar cane mulch, etc. *** NOTE: If you want to add other ingredients such as worm castings or rock dust into your no dig garden, you can also add them to this layer. 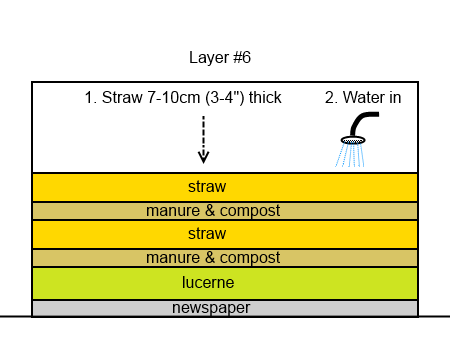 Lay down another layer of straw approximately 10cm (4”) thick over the layer of manure or manure/compost. You can use any carbon containing material such as peas straw, hay, sugar cane mulch, etc here. Make holes in the top layer of straw approximately 10-15cm (4-6”) wide, and equally deep. Plant seeds, seedlings or plants. You can also add seaweed extract to the water when you water in the seeds/seedlings or plants. Plants really do need more than the basic NPK (nitrogen, phosphorus, potassium) of chemical fertilizers. Seaweed contains just about every beneficial mineral, including all the trace elements that plants need, and it really helps your plants develop strong, healthy roots. Now you’ve finished, just step back and admire your newly constructed no-dig garden bed! It’s that easy, and that’s how you build it, in 10 simple steps! The steps above outline just one of the many no-dig gardening ‘formulas’. There are many ways to build no dig gardens, and there are many recipes for what to use for each layer. Some no-dig gardens can be very high and free-standing, while others can be low. They all work because they use the magic natural formula that we also use in composting, alternating layers of carbon-rich materials and nitrogen-rich materials. So far we’ve only discussed building no-dig gardens as a means of creating new garden beds, but the beauty of this system is that you can also convert existing garden beds to a no-dig system, and it’s even easier. Building new gardens from scratch is one thing, but it doesn’t happen very often. More often we encounter a tired, run-down garden bed where the soil is depleted and compacted, where nothing much grows in it other than weeds. It’s even easier to ‘retrofit’ and existing garden, to renovate it and convert it into a no-dig garden. You can even use this technique to transform a fully planted garden bed into a no-dig garden, as you’ll simply be laying down a two-layer mulch! If necessary, loosen compacted soil. 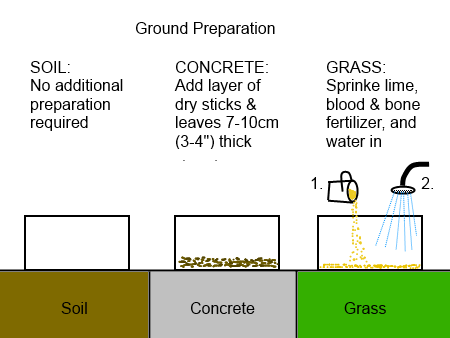 If the soil is not compacted, go to Step 2. 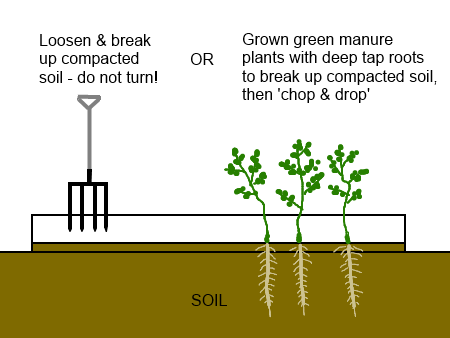 You can loosen compacted soil manually with a garden fork, which takes a few minutes, or you can plant ‘green manure’ plants with deep tap roots, which will drill into the compacted soil and break it up. This will take much longer (a few months!) as the plant grows through its growing season. Once the plants starts to flower, it is cut down and the soil level and dropped on the soil surface, with the roots left in the ground – this is “chop & drop”. The roots will then break down and create deep air and water channels, and the soil will be loosened up naturally. The most important thing to do is to give an old garden bed a head start, once the soil is loosened, it will never be compacted ever again, because you don’t step in a no-dig garden!!! To loosen compacted soil, break it up with a garden fork, but don’t turn it over – we’re just trying to make the soil loose and friable here, we’re not trying to kill all the soil ecology, which is what turning the soil does in conventional gardening, and why it’s done! Once we soil is loosened, and the no-dig garden layers are added, they will start to break down, adding organic matter to the soil, and the earthworms will do all the digging from there on, taking the nice organic matter from the surface and carrying it further into the soil, slowly converting the soil underneath into a rich, dark humus – real soil! remember, humans don’t dig, earthworms do, and they do a much better job than us, so leave the digging to the experts, the earthworms, and save your time and energy! Sprinkle a thin layer of manure. 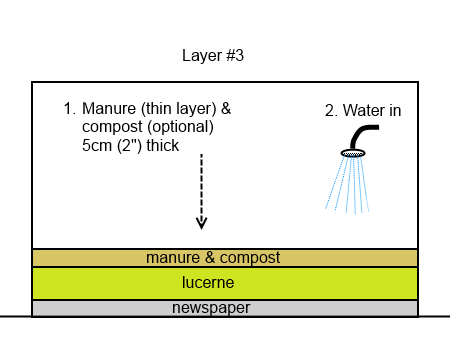 You can also add compost to create a layer up 5cm (2”) thick, but a thinner layer is just fine. If there are existing plants in the garden bed, keep the materials away from the stems/trunks to avoid ‘collar rot’ – rotting the base of the plant. You can also add other ingredients such as worm castings (a rich fertilizer filled with lots of beneficial soil organisms) or rock dust (a slow release source of trace elements and minerals) into this layer. You can add seaweed extract to the water, it’s rich in potassium which helps fruiting and flowering, and is loaded with lots of minerals which help the plants develop a strong and healthy root system. If there are existing plants in the garden bed, keep the mulch away from the stems/trunks to avoid ‘collar rot’ – rotting the base of the plant. Using a watering can or hose, water in well. You can use seaweed extract with the water once again. So, in 3 easy steps, you’ve just converted your existing garden to a no-dig system. Make sure you don’t step in the garden and compact the soil once again, use paths – garden beds are for plants, paths are for humans! Remember, you and the plants have conflicting needs, they need soft, loose friable soil that they can easily sink their roots into, you want firm stable paths you can walk across that you won’t sink into! To maintain any type of no-dig garden, you only need to repeat the above three steps detailed in “Converting Existing Gardens to No-Dig Gardens”. After the plants are harvested and the growing season has ended, the layers will have rotted down into the soil, enriching and improving it. It’s then time to replenish the no-dig layers. You’ll replenish them at the end of each major season (when all the winter crops are finished, and then again when all the summer crops are finished). That’s all you need to do until the next growing season! Quite simple really! So, in conclusion, with no-dig gardening, you can reduce your effort and time spent in the garden, save energy and water, maintain a healthy soil ecology, and let Nature do the work. It’s the way Nature does it, and it’s the most sustainable way you can garden!